Newly commissioned missionaries and deaconesses are presented during a mission celebration on April 29 at the 2012 United Methodist General Conference in Tampa, Fla.
A UMNS photo by Paul Jeffrey. Click on image to enlarge.View more photos. After a day of non-legislative activities, delegates to the United Methodist General Conference returned to the Tampa Convention Center April 30 to begin five days of processing some of the 1,200 petitions that wove their way through legislative committees. A proposal to add a paragraph to the Constitution that would enable the Council of Bishops to elect a full-time president without residential responsibilities did not receive the necessary two-thirds majority (490 in favor, 399 opposed). Delegates voted down a call for a four-year study on the matter, and they voted against a plan whereby General Conference would elect the set-aside bishop before voting on the proposal recommended by the Superintendency Legislative Committee. UMNS asked Bishop Larry Goodpaster if the council had any backup plan. "We've been functioning like this since 1968," Goodpaster said. "We will continue in the same manner." The Rev. Kabamba Kiboko, the Rev. Dennis Blackwell, Oswald Tweh and Beth Capen were elected to Judicial Council. Blackwell, a New Jersey pastor, and Capen, an attorney, were re-elected to the nine-member council, which serves as the denomination's supreme court. Kiboko is the first clergywoman ordained in the Southern Congo Conference and she holds a doctorate in Old Testament from Iliff School of Theology at the University of Denver. Tweh is an attorney from Liberia and former president of the Liberian National Bar Association. Jan Love, the Rev. Kasap Owan, the Rev. William Abraham and the Rev. Bill Arnold were elected to the University Senate. Love is dean of Candler School of Theology, Owan is president of Katanga United Methodist University, Abraham is a professor at Perkins School of Theology, and Arnold is former provost of Asbury Theological Seminary. On Sunday, delegates, staff and visitors attended neighboring churches, and hundreds attended a convention center service celebrating 40 years of the Commission on the Status and Role of Women. Sunday evening delegates and visitors also gathered for an Africana Dinner sponsored by Black Methodists for Church Renewal. In an address, Sierra Leone Bishop John Yambasu, said "When we all get to heaven, there will only be one question asked of us. It will be, 'Did you spend your time on earth making it a better place?'" 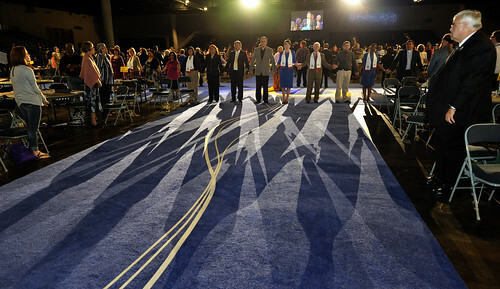 After the dinner, delegates returned to the convention center for a three-hour celebration of a variety of United Methodist ministries, including the 20th anniversary of Communities of Shalom, the 40th anniversary of the Commission on the Status and Role of Women and the 100th anniversary of Girl Scouts. Bishop Thomas Bickerton, leader of The United Methodist Church's Imagine No Malaria effort, told the assembly that bed nets and other measures have decreased the number of malaria-related deaths from one every 30 seconds to one every 60 seconds. He also announced two new partners in the war on malaria, Variety magazine and retired basketball star Shaquille O'Neal. Bickerton introduced two Ohio youngsters who sold lemonade to raise money for bed nets. Logan Martins, 11, applauded the reduction by half of the worldwide malaria death rate, but asked, "Why can't it be never?" The evening also included a report on the Four Areas of Focus. During a discussion on ministry with the poor, the Rev. Lorenza Andrade-Smith, of San Antonio, said she sold her possessions to live in solidarity with the homeless. She told of being refused entrance to a homeless shelter "because they said my communion set could be used as a weapon. &ellipsis; My communion set is a different type of weapon, more of a force. It witnesses to the very presence of Christ, who calls us to be in ministry with the poor. Ministry with the poor simply means following Jesus." In a presentation on new places for worship, Bishop Mike Lowry reported that 612 churches have been started since the last General Conference, more than half racial/ethnic congregations. Lowry said he expects the total will increase to 650 by the end of the 2012. The Rev. Bob Williams, top staff executive for the Commission on Archives and History, noted that it was 200 ago that lay members first gathered with bishops and pastors for the first quadrennial General Conference, May 1, 1812. Williams donned early American Methodist leader Francis Asbury's eyeglasses to see how the church looks through the glasses of one of the founders of the American church. He announced the view was "pretty blurry." Two Boy Scouts received Good Samaritan Awards. Justin Jackson, a 17-year-old from Seffner, Fla., received the award from United Methodist Men for pulling a woman out of a burning car. Ryan Wilson, a 29-year-old with Down syndrome who achieved the rank of Eagle Scout, also was honored. After the evening plenary, some 100 people gathered in the park across from the convention center for a vigil to remember victims of violence. The event was sponsored by the United Methodist Board of Church and Society and Commission on Religion and Race. More than 500 people attended an April 29 service to commission 23 missionaries and 17 deaconesses and home missioners at nearby Palma Ceia United Methodist Church. While questions about consolidating United Methodist general agencies have occupied most of the hallway conversations, it appears that the matter will not be considered until May 2 to provide time for the printing of a proposed alternate structure in the Daily Christian Advocate. Delegates were told that the proposed plan to be printed is a compromise between members of the Connectional Table and authors of "Plan B." Authors of the new proposal will be included in the DCA to be delivered the morning of May 1. It is conceivable that delegates could decide to suspend the rules to vote on the plan on May 1, but most delegates think it will require the normal 24 hours for study. During April 25-28 meetings, the General Administration Committee considered plans proposed by the Connectional Table and a structure proposed by the Methodist Federation for Social Action. They then decided they would perfect "Plan B," a proposal introduced to the committee at Tampa. The committee subsequently defeated all plans, leaving no recommended plan for the conference to consider. However, it only takes 20 people to bring any of the proposals to the plenary floor. It is conceivable that the MFSA plan and the Connectional Table plan could be considered along with the compromise proposal to be printed in the May 1 DCA. Re-elected the Rev. Fitzgerald "Gere" Reist as secretary of General Conference. Took the first step in adopting a new constitutional amendment that calls United Methodists to join other Christians to pray, seek and work for unity with other Methodist churches and united churches related to the Methodist church. Agreed to ask the Commission on Religion and Race and the Commission on the Status and Role of Women to partner with the Council on Finance and Administration to determine fair and just recommendations for withholding funds from agencies accused of engaging in discriminatory practices. Defeated an effort to amend the Constitution to limit the terms of bishops to eight years with the possibility of one re-election; a motion to refer this for study was also defeated. Approved a resolution calling for the recognition of the Northern Cheyenne tribe of Montana, the Cheyenne and Arapaho tribes of Oklahoma and the Northern Arapaho tribe of Wyoming as federally recognized tribes as stated in an 1865 treaty. Increased the number of youth, young adults and persons from central conferences on the 25-member Commission on General Conference. Agreed to call for translation of Advance Edition of the Daily Christian Advocate into Kiswahili, French and Portuguese. Delegates were informed the cost for a Kiswahili edition is $800,000. *Peck is a retired clergy member of New York Annual Conference and a 12-time veteran of General Conference, four times as editor of the DCA and three times as editor for UM News Service.